Arizona is home to more than 20,000 nonprofit organizations that employ more than 160,000 people, and engage thousands volunteers. They play a central role in everyone's life. While every nonprofit has its own challenges, some issues affect us all. The Alliance works with nonprofits to monitor legislation that impacts the entire sector. By working together, our collective voice is heard at the local, state and national levels. Also equally important is the role the Alliance plays in educating, information and empowering our each individual nonprofits to advocate on their own on behalf of the causes they are specifically serving. Each year, we provide critical training to help educate nonprofit staff and boards on how to effectively advocate for their causes. Learn more about how the Alliance is working to advance the common good of the sector - and how you can get involved. Can nonprofits engage in advocacy, public policy and lobbying? Don’t feel like you have to believe us – read the laws here to see for yourself how the U.S. Constitution, Congress, and the IRS have protected the rights of nonprofits to engage in advocacy and legislative lobbying. See the confirmations from informed lawyers, accountants, and others that you have the legal right to advocate to advance your nonprofit’s mission. And explore the easy ways to comply and protect your rights. The Nonprofit Leadership Council is an advisory group made up of Alliance members from across the state. The Council serves as a sounding board and provides Alliance staff and leadership with critical input from the nonprofit community. The Nonprofit Policy Council begins drafting our Legislative Agenda of priority issues and areas of focus in the fall of each year, which guides us in the next year's legislative session. The Council makes the recommendation to the Board of Trustees, who vote to approve the agenda in December of each year. Click here to view the most recent Legislative Agenda. The Alliance is also frequently called up on to take a position or sign on to support certain bills, propositions or other important issues. In order to help guide our decision making, we rely on our Board-approved Public Policy Framework. You can view this by clicking here. The Alliance provides a variety of in-person and webinar training around the topics of advocacy and public policy, as well as timely, relevant issues as they come up throughout the year. These programs are available either free or at a reduced cost for our members, and are accessible throughout the state. Click here to view the calendar of upcoming advocacy-related training. Watch our previously recorded advocacy webinars. When critical or timely issues arise, the Alliance will send out an Advocacy Alert email to our members to keep them informed of issues that could positively or negatively impact their organizations or the causes they serve. These communications will also normally include a Pulse Poll, which is a short survey to gather immediate feedback from our members as to the potential impact of pending legislation or other issues. The Alliance can then begin to take action, gather more information, or develop resources to assist our affected organizations. Click here to join our email list. Alliance members receive a free subscription to the Advocacy Matters electronic newsletter distributed by the National Council of Nonprofits. This keeps members up to date on the important issues on a national scale, but also provides insight to similar issues that nonprofit organization in other states may be facing. It also helps connect our members to a nationwide network of peers. The Alliance also collects various news and articles and stores them on our website. Click here to view recent advocacy and public policy news. Each year, the Alliance hosts a day of Advocacy at the Arizona State Capitol for our member organizations. 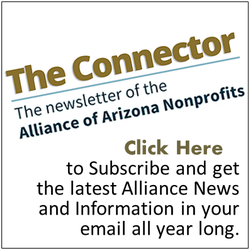 This provides us with an opportunity to meet with legislators and discuss the important role the nonprofit sector plays in Arizona, along with outlining any specific or pending legislation that could positively or negatively impact the sector. The day also includes educational sessions on advocacy, public policy and how to most effectively interact and engage with legislators and public officials. We normally also coordinate small group meetings for attendees with legislators. Our next Day of Advocacy is scheduled for January 26, 2017. Please click here to view the calendar for information about this and other advocacy events. First, voter registration, education and mobilization are completely allowed by IRS rules. Second, voter engagement undertaken by nonprofits is non-partisan: we do not seek specific election outcomes by supporting specific candidates, and therefore we do not seek to register and mobilize only certain voters. Third, each nonprofit can decide how extensive its efforts will be, but every nonprofit can at least participate at some minimal level.